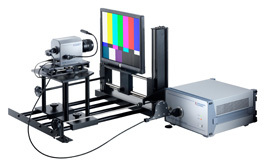 Complete systems based on the CAS 140CT array spectrometer featuring a high-end, back-illuminated CCD detector are available for measurements of radiance and luminance as well as color of displays and back-illuminated panel graphics. No matter what kind of display technology has to be tested – whether LCD, CRT, OLED or LED displays – the DTS140 can be used universally. The fiber coupling of the TOP 200 makes it possible to simply swap the adapter and quickly reconfigure the DTS140 for other applications (e.g. LED measurement). The range of applications available is thus considerably expanded – a feature hard to realize for spectrometers with a fixed, integrated lens.